The Australian Government allotted a AUD 3.5 billion (USD 2.5 billion) for the first stage of the Western Sydney North South rail link from St Marys to Western Sydney International (Nancy-Bird Walton) Airport and Badgerys Creek Aerotropolis. The metro-style service will become the transport spine for the Western Parkland City, connecting travellers from the airport and the Western Sydney Aerotropolis to St Marys and the rest of Sydney’s rail system. The Australian government’s contribution includes AUD 50 million (USD 35.5 million) towards the business case process as well as AUD 61 million (USD 43.4 million) to construct the Elizabeth Drive Overpass, which is an essential piece of infrastructure that will enable safe, cost-effective and efficient access for the metro service to the airport site. 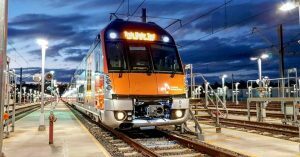 The Australian and New South Wales governments partnered to undertake the joint Western Sydney Rail Needs Scoping Study which identifies two preferred direct rail links to Western Sydney Airport. The North-South rail link has been estimated at USD 10.67 billion – USD 14 billion.